I first decided to read a Kathy Reichs book after hearing her in a radio interview. I had never before heard of the field of forensic anthropology, and found Reichs’s description of her profession fascinating; particularly her account of her work Hawaii, identifying the remains of US casualties from the Vietnamese, Korean and Second World Wars. 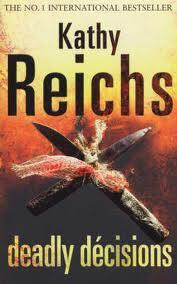 Another factor in choosing to read some Reichs is that my father is a fan, and as such I have ready access to much of Reichs’s back catalogue. Deadly Décisions was the earliest instalment in the series I could find, so Deadly Décisions I duly read. Deadly Décisions is centred on Reichs’s regular heroine Temperance ‘Tempe’ Brennan. Brennan, like her creator Reichs, is a forensic anthropologist who divides her time between Montreal and North Carolina. She is divorced, owns a cat, has an on again/off again beau named Andrew Ryan, and enjoys cooking and watching sports. This particular instalment of the Temperance Brennan cycle concerns Montreal’s feuding motorcycle gangs. Reichs is at her best when writing about her profession, and the book does contain some interesting technical detail. Chapter 8, in which Brennan describes the use of Ground Penetrating Radar in the search for bodies, is particularly engaging. Her pedigree as a forensic anthropologist notwithstanding, Kathy Reichs is not a terribly good novelist, and Deadly Décisions remains a very unexceptional novel. One ponders what the competition was for – ‘Most saccharine essay title’, perhaps? I genuinely winced at that one. This exchange is meant to illustrate the friction that is alleged to exist between Brennan and Claudel, due to some disagreement that occurred in the first book. Claudel seems quite reasonable (if a little distant); Tempe Brennan seems to be going out of her way to dislike the man. It’s a bad sign in a novel when, as a reader, you don’t sympathise with the main protagonist. Aside from the unlikeable Dr Brennan, the dialogue is dreadful (even discounting the similes), and any time a character is in jeopardy it doesn’t seem believable and I probably wouldn’t have cared even if it was. On the plus side, Reichs’s descriptions of Montreal are quite nice. All in all, a pretty poor book, El T advises that you avoid it. What a wonderfully opaque blurb: Do they mean "Better than Patricia Cornwell!! "; or "bit 'meh', but at least it's better than Patricia Cornwell"? Actually, this review kind of makes me want to read this book. Especially this bit - “And Kit could get sucked into the feeding frenzy!”, and especially this bit "On the plus side, Reichs’ descriptions of Montreal are quite nice." Also, Yiddish Policeman's Union was great, although I lost my copy just after the bit where the detective fellow gets shot, so I never finished it. Great setting though. Also - Hello, el tarrangu!